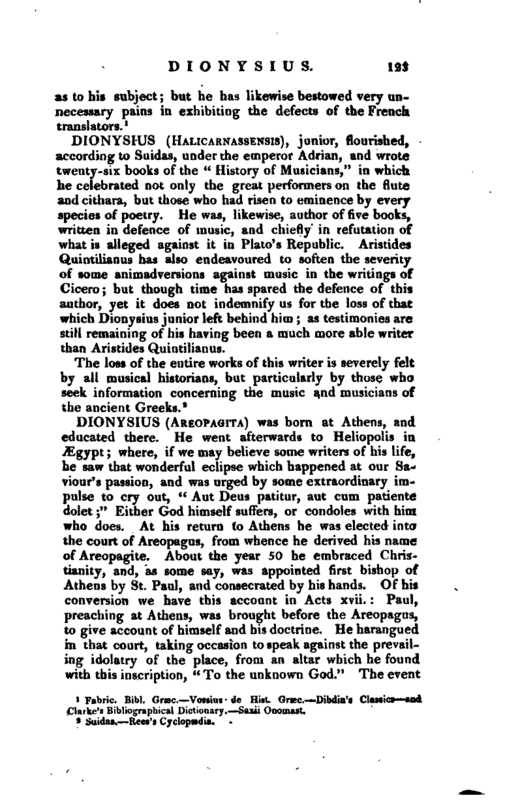 , a historian and critic of antiquity, was born at Halicarnassus, a town in Caria; which is also memorable for having before produced Herodotus. He came to Rome soon after Augustus had put an end to the civil wars, which was about 30 years before Christ; and continued there, as he himself relates, twentytwo years, learning the Latin tongue, and making all necessary provision for the design he had conceived of writing the Roman history. To this purpose he read over, as | he tells us, all the commentaries and annals of those Romans who had written with any reputation about the antiquities and transactions of their state; of such as old Cato, Fabius Maximus, Valerius Antias, Licinius Macer, and others; but owns, after all, that the conferences he had with the great and learned men at Rome upon this subject, were almost as serviceable to him as any thing he had read. His history is entitled “Of the Roman antiquities,” and was comprised in twenty books, of which only the first eleven are now extant. They conclude with the time when the consuls resumed the chief authority of the republic, after the government of the decemviri; which happened 312 years after the foundation of Rome. The entire work extended to the beginning of the first Punic war, ending where Polybius begins his history, which is about 200 years later. 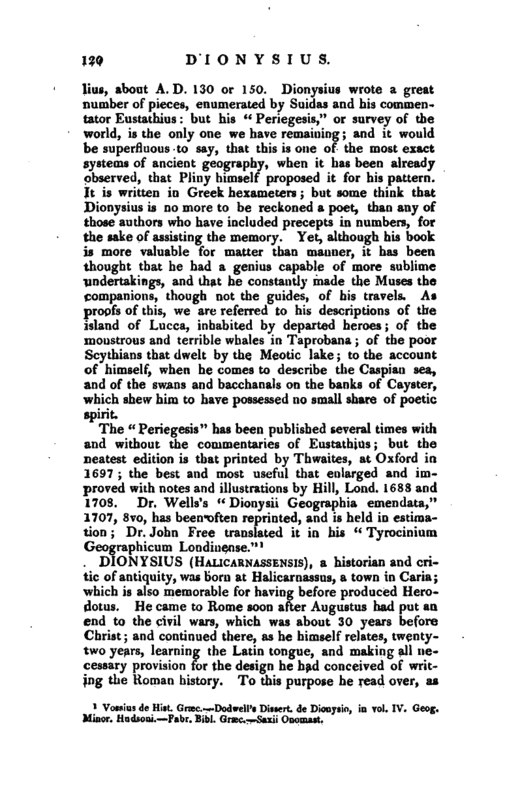 Some have imagined that Dionysius never ended his work, but was prevented by death from composing any more than eleven books out of the twenty which he had promised the public; but this is contrary to the express testimony of Stepbanus, a Greek author, who quotes the 16th and 17th books of Dionysius’ s Roman antiquities; and Photius, in his Bibliotheca, says, that he had read all the twenty, and had seen the compendium or abridgment which Dionysius made of his own history into five books, but which is now lost. The reputation of this historian stands very high on many accounts, notwithstanding the severe attacks made on him by Mr. Hooke, in his “Observations, &c.” on Middleton and Chapman, &c. 1750, 4to. As to what relates to chronology, all the critics have been apt to prefer him even to Livy himself: and Scaliger declares, in his animadversions upon Eusebius, that we have no author remaining, who has so well observed the order of years. 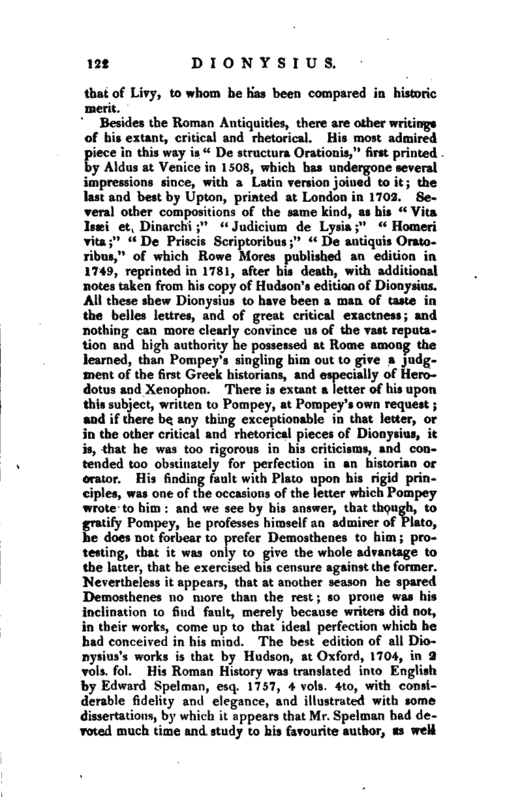 He is no less preferable to the Latins on account of the matter of his history; for his being a stranger was so far from being prejudicial to him, that on this single consideration he made it his business to preserve an infinite number of particulars, most curious to us, which their own authors neglected to write, either because, by reason of their familiarity, they thought them below notice, or that all the world knew them as well as themselves. His style and diction, however, although pure, insomuch that many have thought him the best author to be studied by those who would attain a perfect knowledge of the Greek tongue, is not so elegant or lively as | that of Livy, to whom he has been compared in historic merit. Fabric. Bibl. Grasc. —Vossius <le Hist. Grxc. 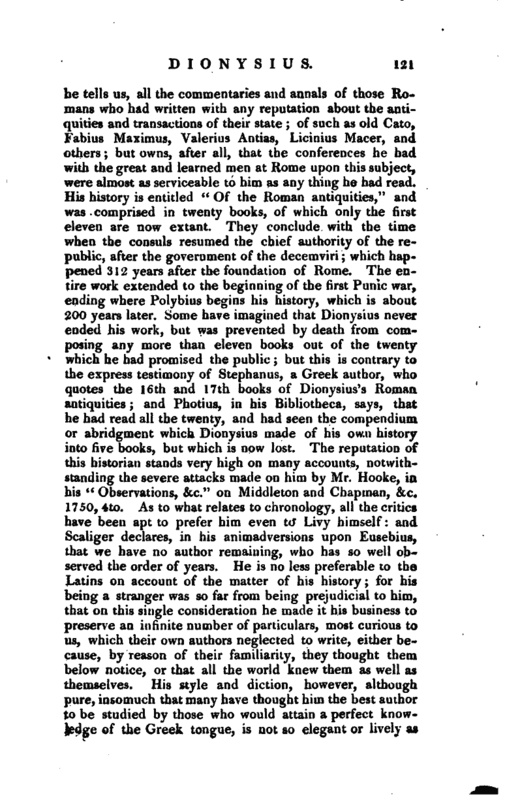 Dibdin’s Classics and Clarke’s Bibliographical Dictionary. —Saxii Onomast.